Keywords: Sorption-desorption processes; metals and metalloids; soil environments. Trace elements may be present in solution with positive or negative charges and in different redox state. They occur predominantly in cationic form (Pb, Cu, Zn, Ni, Cd, Hg, Cr(III), Co) but some trace elements are present in anionic form (As, Se, Cr(VI), Mo and B). In soil environments, sorption/desorption reactions on/from inorganic and organic sorbents control the concentration of metals and metalloids in solution and affect their bioavailability, leaching and toxicity. Sorption-desorption processes of elements in cationic form differ greatly from those in anionic form. These reactions are affected by many factors, such as pH, nature of the sorbents, presence and concentration of organic and inorganic ligands, including humic and fulvic acids, root exudates and nutrients. Furthermore, redox reactions, both biotic and abiotic, are of great importance in controlling the oxidation state and thus, the mobility, the phytoavailability and the toxicity of many elements, such as Cr, Se, Co, Pb, As, Ni and Cu (Kabata-Pendias, 2001; Huang and Germida, 2002; Violante et al, 2002; Sparks, 2003; Huang and Gobran, 2005; Violante et al., 2007). The aim of this presentation is to provide information on the factors which affect the mobility of trace elements. Special attention is devoted to the influence of inorganic and organic ligands, including nutrients and root exudates, on the sorption/desorption processes of trace elements in cationic and anionic forms on/from soil components, soils and selected synthetic minerals (double layered hydroxides, the so called "anionic clays"). The soil components responsible for trace element sorption include, soil humic substances, phyllosihcates, carbonates and variable charge minerals (constituents such as Fe, Al, Mn and Ti oxides, short-range ordered aluminosilicates as well as phyllosihcates coated by OH-Al or OH-Fe species whose charge varies with the pH of the soil solution). Recently, evidence on the sorption of heavy metals on microorganisms have been reported (Jackson, 1998). Soil components differ greatly in their sorption capacities, their cation and anion exchange capacities, and the binding energies of their sorption sites. Trace element sorption kinetics depend on the type of surface and trace element, but generally are rapid. Half times for bivalent cations, such as Pb, Zn, Cu and Cd, sorption on peat range from 5 to 15 seconds. Except for some noncrystalline minerals that have very high specific surface charge density with highly reactive sites, humic substances appear to have the greatest capacity for sorption of trace elements in cationic form. A body of evidence has demonstrated that humic matter and metal oxides are much more effective scavengers of trace elements in cationic form, than even the most efficient sorbent among phyllosihcates, indicating that specific sorption and other complexation processes are the dominant binding mechanisms (Jackson, 1998; Huang and Germida, 2002; Spark, 2003). Complexation reactions have the following effects: i) metal ions are prevented from being precipitated; ii) complexing agents can act as carriers for trace elements in soil solution; iii) their toxicity is often reduced by complexation. Trace elements in cationic form are probably not dominantly sorbed on 001 faces of phyllosihcates because they are always vastly outnumbered by other cations with which they compete (Jackson, 1998). They may be strongly sorbed only on the edges of the phyllosilicates. However, clay minerals have also an important role as carriers of associated oxides and humic substances forming organo-mineral complexes, which present peculiar sorption capacities different from those of each single soil constituent. Variable charge minerals selectively sorb polyvalent cations even when their surfaces are positively charged (solution pH values lower than the point of zero charge [PZC] of the sorbent). Most transition cations (Pb, Cu, Cr, Ni, Co, Zn, Al, Fe, Mn) are often sorbed more strongly than alkaline earth cations. Spectroscopic techniques such as electron spin resonance (ESR) and Extended X-ray Absorption Fine Structure Spectroscopy (EXAFS) have been used for the identification of metal complexes at the surfaces of Al, Fe or Mn oxides, silicate clays and soil organic matter (Sparks, 1999). The mechanism of metal ion association with hydrous oxide surfaces involves an ion exchange process in which the sorbed cations replace bound protons. Usually, specifically sorbed cations raise the value of PZC of variable charge minerals. pH affects sorption of trace elements, either by changing the number of sites available for sorption (sorption increases by increasing pH) or by changing the concentration of cation species (Me2+, MeOH+, Me(OH)2). The nature, crystallinity, size of the crystals, surface charge of metal oxides play an important role in the sorption selectivity of trace elements in cationic form. Sorbed trace element species may range from simple cations to complex polynuclear hydroxides formed by hydrolysis and condensation in solution or by nucleation on the mineral surfaces (Jackson, 1998). In the last decade extensive research has been carried out on the heterogeneous precipitation of trace elements on the surfaces of minerals, using modern spectroscopy techniques such as synchrotron-based X-ray absorption spectroscopy (Sparks, 2003; Borda and Sparks, 2008 and references therein). Reported observations include zinc precipitates on calcite, cobalt precipitates on A1203, polynuclear chromium(III) hydroxide structures on silica and goethite, and the formation of mixed nickel-aluminum hydroxides on pyrophyllite (Scheidegger etal., 1996). Few studies have been carried out on the competition in sorption of trace elements to soil components and soils. Competition in sorption between two or more trace elements is of paramount importance for understanding their relative affinity for a given sorbent (Violante et al., 2003). Many factors such as pH, surface properties of the sorbents, the number of sites available for sorption, the nature and charge of Me-L species in solution influence trace element sorption onto soil inorganic components (phyllosilicates and variable charge minerals) in the presence of inorganic and biological ligands. Inorganic and organic ligands (e.g., organic acids) which form strong complexes with trace element cation usually prevent or reverse their association with negatively charged sorbents, as clay minerals, by forming stable dissolved or dispersed negatively charged complexes with the cations (Violante et al., 2007). In contrast, the presence of certain foreign ligands, occurring naturally in the rhizosphere, such as siderophores produced by microorganisms and phytosiderophores exuded by plants, may promote the formation of positive complexes and, consequently, the sorption of trace elements onto phyllosilicates. The processes, which affect the sorption of trace element cations onto variable charge minerals in the presence of chelating agents, are particularly complex and are different from those onto phyllosilicates (Violante et al, 2007). Usually, high concentrations of low molecular weight organic acids may promote the formation of negative complexes with metal ions and favour their sorption onto variable charge minerals, whereas siderophores may promote the formation of positive complexes, preventing sorption. In conclusion, biological ligands play a very important role on the mobility and then the phytoavailability of trace elements at soil-root interface (Huang and Germida, 2002). Trace elements which exist in anionic form are sorbed primarily by chemisorption at reactive sites of metal oxides and allophanes and at the edges of phyllosilicates. 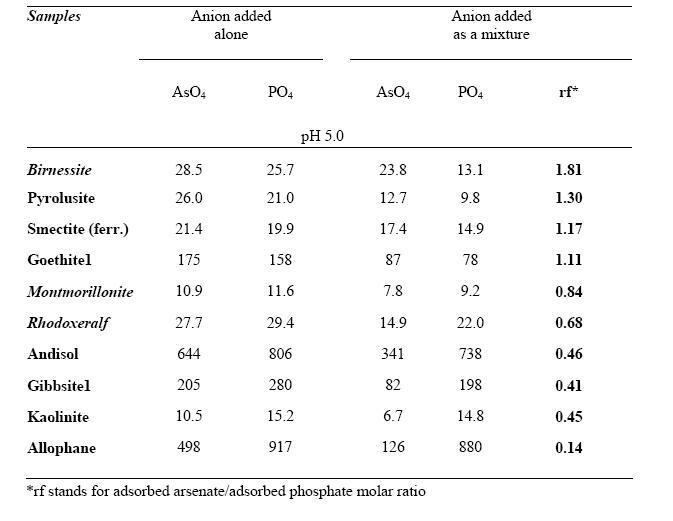 Sorption of anions onto variable charge minerals and soils varies with pH. 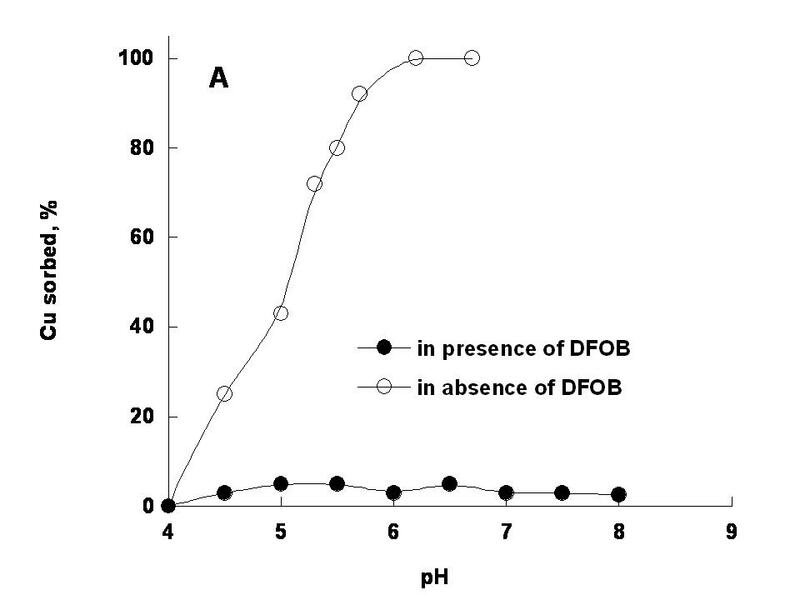 With increasing pH, within a certain range, sorption decreases (due to a decrease of positive charge of minerals) or else increases to a maximum close to the pKa for anions of monoprotic conjugate acids and then decreases. Anions may be specifically or nonspecifically sorbed. Ligands which are specifically sorbed replace OH" or OH2 groups from the surfaces of variable charge minerals. Specific sorption is also termed inner-sphere sorption because it involves direct coordination to the surface metal atom. Nonspecific sorption is also termed outer-sphere sorption and is influenced by the ionic strength of the system. Specifically sorbed anions usually lower the PZC of metal oxides, thus the PZC of a particular oxide may give rise to different values depending on the kind and extent of foreign ion sorption (Sparks, 2003). Table 1. 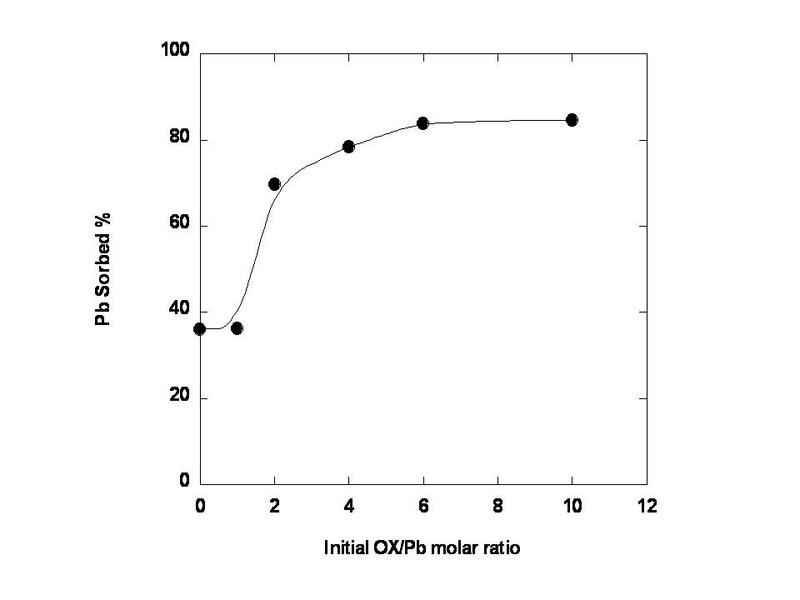 Adsorption (mmol kg-1) of arsenate (As04) and phosphate (P04) after 24 h of reaction on metal oxides, phyllosilicates and soils at pH 5.0, when the ligands were added alone or as a mixture (initial P04/As04 molar ratio of 1.0). Modified from Violante and Pigna (2002). The presence of organic and inorganic ligands also affects the sorption of trace elements in anionic form by competing for available sorption sites and/or reducing the surface charge of the variable charge minerals and soils (Violante et al., 2005; 2007). The competition depends on the affinity of the anions for the surfaces of the sorbents as well as the nature and surface properties of the minerals and soils. Competition may be easily observed at sufficient high surface coverage. It has been demonstrated that competition in sorption between phosphate and arsenate may vary greatly on different soil minerals and on soils characterized by different mineralogy and chemical properties, although it has been established that the chemical behaviour of arsenate is similar to that of phosphate. Time of reaction and the surface coverage have also a great influence on the competitive sorption between trace elements and organic and inorganic ligands (Violante and Pigna, 2002). Most competitive sorption studies have been carried out adding the ions contemporaneously. In natural environments, however, it is more likely that the ions will come in contact with a sorbent sequentially, i.e., the solid is exposed to one ion first, with the second ion coming in contact with a solid at a later time. The sorption of metals and metalloids is strongly affected by the order of addition of organic and inorganic ligands and trace elements on the sorbents. It has been demonstrated that larger amounts of selected heavy metals (Pb, Cu) were sorbed when chelating organic anions (oxalate, tartrate) were added before or after the metals as referred to the systems where the heavy metals were added as a mixture with the organic ligands or alone (Violante et al., 2003). In contrast to sorption studies relatively little information is available on the desorption of metals and metalloids from soils or soil components. Presence of inorganic and organic ligands, such as phosphate, sulfate and root exudates, has a significant impact on the desorption of trace elements. Usually, desorption studies have biphasic reaction processes; a fast reaction followed by a slow reaction. A number of factors, such as the type, mineralogy and crystallinity of the sorbents, the pH, the pe, the surface coverage, the residence time of metals and metalloids on the surfaces of soil components may affect the desorption of trace elements. Some studies on the effect of residence time on the desorption of some heavy metals and metalloids have been carried out. Usually, the longer the residence time, the greater the decrease in trace element desorption, because of a rearrangement of surface complexes and/or a conversion of surface complexes into surface precipitates (Scheidegger et ah, 1996; Pigna et al., 2006; Violante et al, 2006). Figura 4. 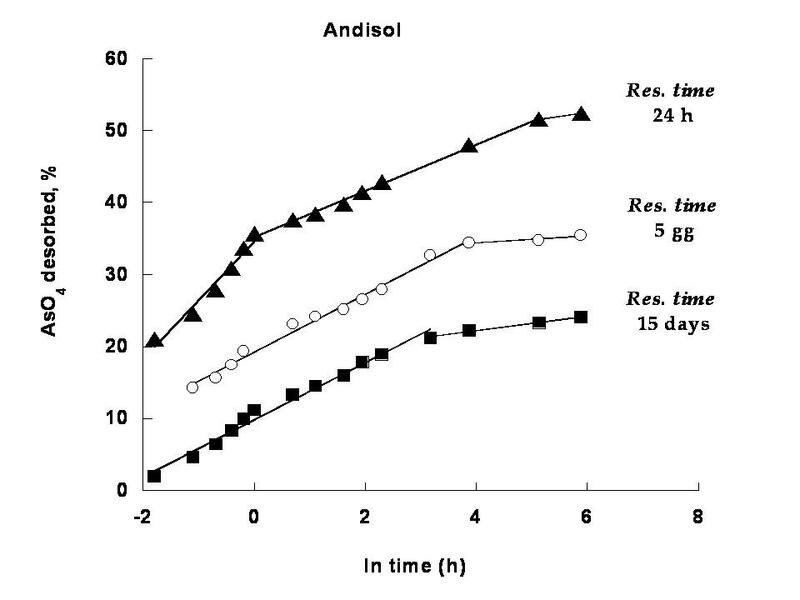 Kinetics of desorption (from 3 hours to 2 months) of As04 by P04 from an Italian Andisol, containing 40% of allophonic material, as a function of residence time, by keeping the surface coverage (70%) and pH (6.0) constant. In soil environments trace elements may be not only sorbed on but also coprecipitated in metal oxides. Coprecipitation of arsenic with iron or aluminum occurs in natural environments and is a remediation technology to remove this toxic metalloid from drinking waters and hydrometallurgical solutions. Violante et al. (2006, 2007) studied the nature, mineralogy and reactivity towards phosphate of iron-arsenate or aluminum-arsenate coprecipitates The mineralogy, surface area and chemical composition of the coprecipitates were affected by pH, arsenic concentration and aging. 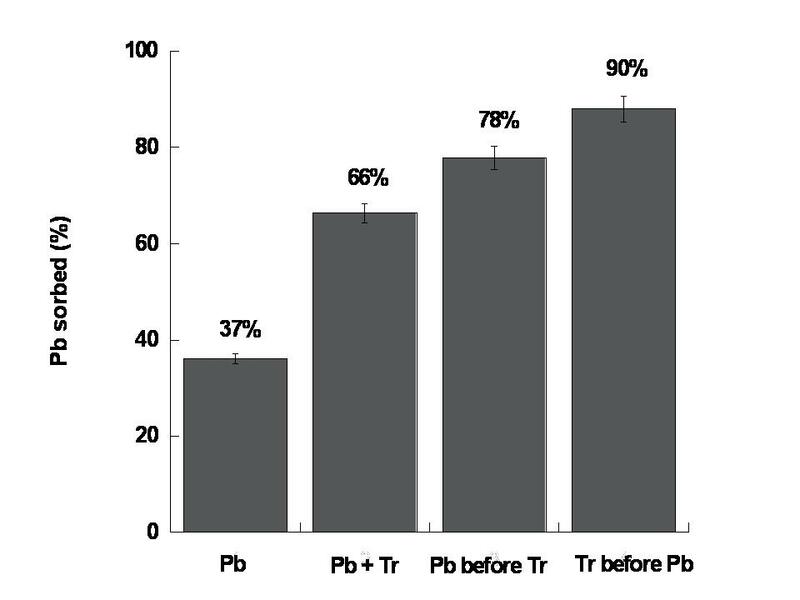 Less than 20% of arsenate present in the coprecipitates was removed by phosphate and more from the aluminum-arsenate than iron-arsenate samples. These authors also found that more arsenate was desorbed by phosphate from a ferrihydrite or boehmite on which arsenate was added than from an iron-arsenate or aluminum-arsenate coprecipitates, attributed to partial occlusion of some arsenate anions into the framework of the coprecipitate. In the last decades many studies have been carried out on the possible use of layered double hydroxides (LDHs) as powerful filter for removing anionic pollutants from polluted waters. LDHs are formed in soil environments (Goh et al., 2008; and references there in).